In the final analysis, the new radar combat modes get two thumbs and a big toe up from me. They’re my hands-down favorite added functionality in the game, even more so than the new aircraft. 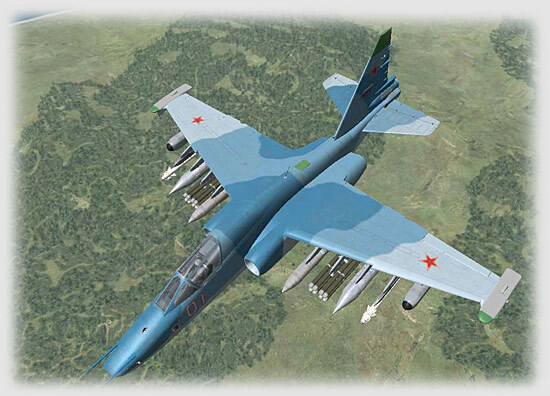 They’re great fun to fiddle with, realistic as heck, and rather more intuitive than the previous setup for Russian aircraft once you get used to it. 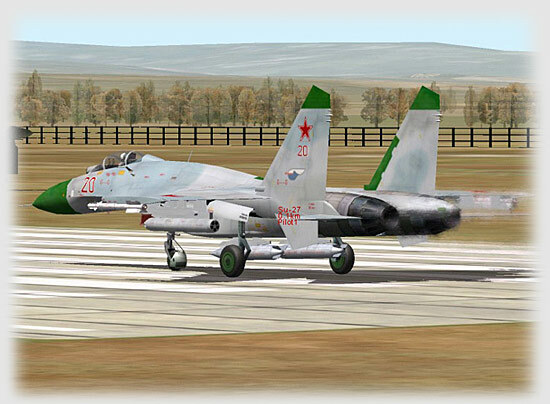 You’ll like this: Russian jets now have lock-on-jam available in DVB-Scan mode. You cannot go to DVB-SNP in an ECM environment. 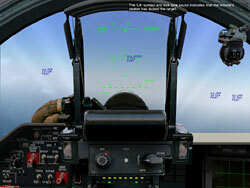 In DVB-Scan’s three submodes (PPS, ZPS, and Auto), you will get jamming strobes that flicker in a vertical band of static across the HUD, and you can command a manual lock-on. Once you do, you will not get any ranging info. You’re firing blind. Call your AWACS for range to target, and once you’re in range, manually set the range carat using your radar range keys and fire! The R-27R/RE and R-77 (RVV-AE) can all track a jamming target, and will default to direct radar guidance or the onboard radar for the R-77 once burn through happens or the target quits jamming. And now these missiles initially guide by inertial updating from your aircraft datalink, much like an AMRAAM does! This means that if you lose lock for an R-27, the missile will use the link to guide via inertial guidance to the target’s last known position. It will re-acquire if you re-acquire the target. R-27R/RE missiles have just become more deadly in the hands of a skilled f-pole jouster. Radar close combat modes are a little different. Although the “Boresight” searchlight mode is no different, the Vertical Scan mode now locks on automatically when a target is in the HUD scan area. Also, the FIO missile-seeker-lock-on mode is VERY different, because it will lock on automatically when you’re using an IR missile! It works very much like a “Visual” AMRAAM launch in the F-15, except you get tone in your headset when the missile is locked to its target. If you can see it, you can kill it, even when you have no HUD. Put it in the center of the combining glass, wait for the tone, and let fly! Also, in Attack mode for all radar modes, there is now a dot in the HUD that tells you where the center of your radar scan zone is. 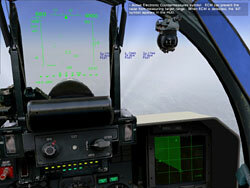 Keep it in the HUD, or gimbal-lock your radar! The EOS has been fine tuned and now will pick up targets in front aspect as far away as 25 kilometers, depending on size and heat signature. You cannot target radar missiles of any type with it, but you can coordinate stealth attacks with R-27T/TE missiles and R-60/73 close combat missiles. You cannot have both radar and EOS active simultaneously. In closing, I think that the new changes to the N-001 and N-019 radar are in many ways a throwback to the days of sims like Falcon 4.0, in the avionics department. No, these Soviet-era radar are not as complex as Falcon’sAN/APG-68 is, but the real Russian radar aren’t, either. They’re different systems, born half a world away and engineered by people with a totally different air combat philosophy than Western sim-aviators are used to. I find them oddly dynamic and intuitive, and at the same time their limitations give one a great appreciation of the West’s technical superiority that continues to this day in the current generation of combat aircraft. Even though it is getting long in the tooth, the current-day F-15C can still stand toe-to-toe with the best the rest of the world has to offer. 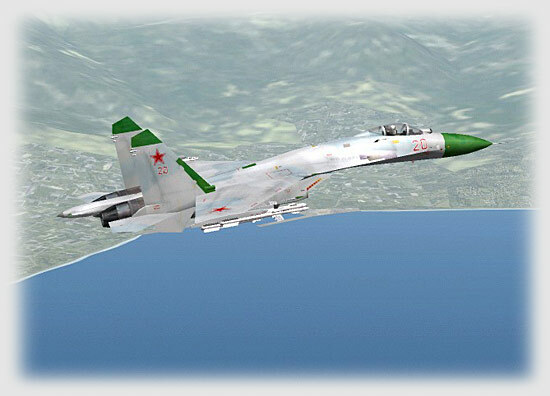 Thanks to Igor Tishin and his Eagle Dynamics crew, the combat aircraft that much of the rest of the world depends on can also be seen and flown in the virtual skies. 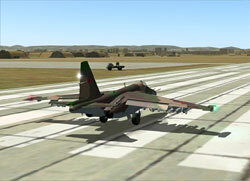 I’m glad to see it, and will greatly enjoy flying the Su-27 and MiG-29 in the future thanks to these changes. Expect Lock On: Flaming Cliffs to be released toward the end of the year, in CD form for Russia, and via direct download for the rest of the world. It’s a good investment for anyone who loves this series of sims and enjoys flying Soviet-era combat aircraft. Don’t miss it. Read Part 1 of the Lock On (v1.1): Flaming Cliffs Preview here. created with Lock On (v1.1): Flaming Cliffs. Fly it! Download the “South of the Border” mission file here (24 kb). Note: this mission is only for Lock On (v1.1): Flaming Cliffs. Download a pdf of this article here (396 kb).